I want to look at one poem here, and leave the context for later. This is a strange poem. The poet looks at the columbine long enough and in such a way that he actually thinks he is a flower. This is a version of Emerson, immersed in Nature, becoming a transparent eyeball. But here, look at the widening sensual range - the eye comes first, but then he feels the breeze, he nods his honey-bell and the bee comes, he drinks the rain and feels the dew and sun. A more complete sensory experience, even though one might think the sensual possibilities of a flower would be quite limited. And then the eye returns at the end, as the poet remembers that he is a person not a flower - his eyes close "like" the petals. It's all just a metaphor, no matter how intensely experienced. Note how the return to reality is reflected in the bumpiness of the last line. The first 13 lines of the sonnet have 10 syllables, but the last line has 12 (counting "flowers" as one syllable), to jar the poet back to himself. R. W. Emerson, "Intellect", p. 421 of the Library of America edition. Is this true? One thing you have to train yourself to do in order to read philosophy is to put that question on hold. If you stop whenver a premise is untrue, you would not get very far with a large share of philosophers. Anyway, I don't think it's true. Some people are wiser than others, actually wiser, not just more artful. Some of us are not very wise at all. Say I modify the statement a little. "Between equally wise persons, the difference is in art." That could be more euphonious. But now it looks true to me. The manner of expression of ideas or wisdom forms a crucial part of their effectiveness or impact. I may have made the sentiment too utilitarian for Emerson's taste, but I feel like I'm moving toward what he really meant. That's why I'm writing here - working on the "art" side. Maybe it will lead to actual wisdom. Maybe it will only help me appear more wise. Maybe it's just vanity. I'll keep trying. We give to much credit to predictions. Tocqueville has a single paragraph predicting that the two great powers in the future would be Russia and the United States. And he was right! For a while, at least. But people used this trivial sliver of his work to bolster his authority. Similarly, Marx and Malthus made some terribly wrong predictions, which has undermined their authority among a lot of people. In the case of Marx, I am tempted to say, good. Anyway, other thinkers have pulled out the more valuable ideas. Malthus's mistakes certainly led to a lot of insights by later demographers and economists. "If ever they should succeed in creating a real revolution among the Russian people, massacre would be performed with the regularity that marks the evolutions of a regiment. Villages would change into barracks, and organized murder would stalk forth armed from the cottages, form in line, and advance in order…"
The Empire of the Tsar, p. 293. The logical place to end my tour of poetry in translation is in Spain, but I don’t know much about 19th century Spanish poetry. Just some names – Becquer, Ruben Dario – subjects for future research. So here’s a 19th century translation of a 15th century Spanish poet. There is some relationship here with humanist ideas that I do not usually associate with Spain. The last stanza contains a sophisticated idea about the difference between the future and the past – why do we think of them so differently? The last line is perfect. This translation was done by Henry Wadsworth Longfellow, young Professor of Modern Languages at Harvard, in 1833, before he had published his own poems. The reputation of Longfellow, once one of the most popular poets of the 19th century, is not very high now. I don’t know his poems well enough to know why. But he was a superb translator of poetry, one of the best. Manrique’s Coplas are one of the few works of any sort that I’ve read in two languages. Longfellow keeps the same form and meter. He changes the rhyme scheme a little (he uses AAB/CCB, while the original is ABC/ABC). He poeticizes some prosaic bits, and rearranges the order of sentences. He omits three stanzas. To me, the mood, the feel is just like the original. Longfellow’s version is a masterpiece. I don’t know why it shouldn’t be as famous as Fitzgerald’s “Rubaiyat”. Too late for that now, I suppose. Longfellow also made marvelous translations of poems of Dante, Michelangelo, Goethe. I think they are models of poetic translation. Maybe a Longfellow revival is due. brushes for teeth, brushes for nails. champion of rights, as in the wrong. look through the pane, and squash the flies. no trace of ink, no spots, no stains. at any other sort of book. at heart by grim remorse’s freezing. A nice mix of reporting and metaphorical language. Just the right mood. It’s hard to read this without wondering about Pushkin’s own death in an idiotic duel not too many years later. Maybe I will write more about Pushkin later. He’s such a varied writer. I’ve read most of what he wrote, or at least most of what’s in English. All of his prose, his tragedy “Boris Godunov”, a substantial share of his poetry. But he’s like Hugo in this way - hard to grasp whole. All of the stanzas I mentioned here are from the Charles Johnston translation. Who knows how this compares to the original. It’s lively, light, poetic. One hopes it’s also accurate, and sounds more or less like Pushkin. Victor Hugo (1802-85), a giant. 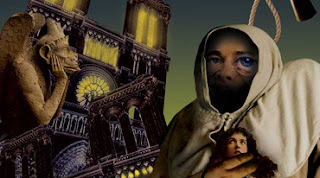 By age 30, he was France’s most famous living poet, a leading playwright, and the author of Notre Dame de Paris, with Quasimodo, now more famous than his creator. And he would continue to write important books for another 50 years. Not someone you get to know by reading one or two books. In French this is a ten line poem with regular end rhymes. Here, the translator has abandoned the original form and made Hugo into a free versifier. He keeps the images, the metaphors, the mood. I notice that the line “Voyez, la grande soeur et la petite soeur” (“Look, the big sister and the little sister”, I think) has completely disappeared. Translators have a lot of power. The Turks were here. Ruin. Grief. like him in the havoc forgotten. more gaily than the cymbals? That’s still a little shocking, I think, even though the politics of Greek independence are lost in the past. Dreaming their time is near. -Oh listen: soft harp-music far away! If this is not beautiful in some way, there is not much else to it. The range of senses is important – the fragrance, then the color of the sky, then the music. Some of the most beautiful poems in the language, Germans say. They say that about a lot of their poets, actually, but mostly because it’s so often true. Writes to greet me in a far-off land. To their goal the thoughts of true love fly. That my face possessed so monstrous a nose! He expected a confession, I don’t doubt. Then he got up to go; I lighted him out. What a totter and a clatter and a rumbling! A man get so quickly to the bottom of a stair! Meine Frau and I once saw Thomas Hampson sing the Hugo Wolf setting of this song with great energy, including some vigorous kicking. The translations are from the Penguin edition. The German is on facing pages, to keep the translator honest. Even to the Ignorant Reader, the German is useful. In “Good Riddance” for example, the “tumbling,/… rumbling” line is “ein Gerumpel,/ Ein Gepurzel, ein Gehumpel!” which is surely in the same spirit. All of ‘em going alike to one sure fate. Of iron that grinds them down into a powder. Down to the bottom through the throat of death. Go, follow the gravedigger’s trade with love – who’s grateful? O my poor black smock! there, growing mouldy. - The gravedigging profession is washed up! The one swell year we had was in ‘Seventeen. The dead filling up the carts like falling snow! That there’s a ray of hope from this cholera. Within a lovely grotto of salami. Belli was a dialect (Romansesco) writer, which adds one more obstacle to translation, as if there were not enough already. These translations are all by Harold Norse, a young Beat poet. On the back cover of my book, he actually says “This keeps me free from schools (beat or square)”, but only a Beat would say that. Norse is an interesting guy in his own right, and has recently (in his old age) gotten some attention as an important gay poet. I recently read someone criticize Norse as having translated Belli into Brooklynese. Well, that’s one solution to the dialect problem. And look at the sophisticated off-rhymes in “The Coffee-house Philosopher” – same/machine/stream, hard/God, circles/falls. He’s does rhyme “bean” with “bean”, which is less sophisticated. If someone has done better with Belli, I’d love to read him. As I read more Custine, it becomes easier to see why he's difficult to read than the typical travel writer. He is always striving for the pithy saying. "To make a great nation is infallibly to create an architecture." That's buried in the middle of a paragraph, when it should either begin or end one. Plus, I'm not sure it's true. His point is that the architecture of St. Petersburg is all borrowed from other countries, is not an authentic expression of the Russian culture. He's probably right about that. Maxim de la Rochefoucauld and Nicolas de Chamfort are two of the greatest aphorists in history. Pascal and Voltaire weren't bad either. They make it look so easy. But they didn't bury their gems in 600 page tomes. You first parents of the human race that ruined yourself for an apple, what might you have done for a truffled turkey? But in your earthly paradise you had no cooks, no fine confectioners. Jean Antheleme Brillat Savarin, The Physiology of Taste, 1825, Chapter XXVII. "The simple knot of Now & Then will give an immeasureable value to any sort of catalogue or journal kept with common sense for a year or two. See in the Merchant's compting room for his peddling of cotton & indigo, the value that comes to be attached to any Blotting book or Leger; and if your aims & deeds are superior, how can any record of yours (suppose, of the books you wish to read, of the pictures you would see, of the facts you would scrutinize) - any record that you are genuinely moved to begin & continue - not have a value proportionately superior? It converts the heights you have reached into table land. That book or literary fact which had the whole emphasis of attention a month ago stands here along with one which was as important in preceding months, and with that of yesterday; & next month, there will be another. Here will occupy but four lines & I cannot read these together without juster views of each than when I read them singly." I keep a sort of memorandum book, just jotting down the events of the day. Most days are pretty empty. I was inspired in some way by reading James Boswell's journals (the first volume, The London Journal, is a delightful masterpiece), but I don't include much real writing like he had. I assume I am keeping this for some future version of myself. That's what Emerson is really getting at here. "The landlord of the Bell - whose magnificent porcelain jars of truffled turkeys are exported to the uttermost ends of the earth -..."
The novel is set in 1822. What might sealed, shipped meat have been like at that time? "I have wept three times in my life. Once when my first opera failed. Once again, the first time I heard Paganini play the violin. And once when a truffled turkey fell overboard at a boating picnic." Would it kill someone to put a citation on this? Anyway, I would not mind a porcelain jar of truffled turkey for Christmas. Sometimes gaps appear in the history of literature. The most notorious is in English drama. Shakespeare and his contemporaries produced an amazing, varied body of work, comedy, tragedy, all sorts of hybrids. The dramatic tradition was strong enough to survive a 20 year closing of the theaters, partly by borrowing new energy from the French and Spanish theater. But for some reason, the great plays begin to disappear. The bizarre, intense "Venice Preserved" by Thomas Otway is considered the last great tragedy (until the 20th century), from 1682. Comedy took longer to expire. "The Beggar's Opera", Goldsmith, Sheridan - the 18th century had some great comedies. But then that was it, for 100 years, until Gilbert and Sullivan. What makes this puzzling is that the English theater itself was active and healthy. Plenty of good actors, too. And plenty of plays, thousands of plays. But none of them are performed anymore, and only a few read for their poetry (Coleridge, Byron, Shelley, for example, all wrote plays - Coleridge even had a hit). The same goes for the American theater, which didn't produce a decent play until the 20th century, and not for lack of trying. I've just come across a new puzzling gap. 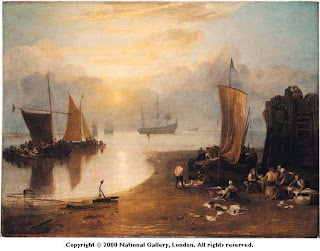 Where are the great 19th century English short stories? They are not, for example, in anthologies of English literature. The list of great American short story writers, all much anthologized, includes Irving, Poe, Hawthorne, Melville, James, Bierce, Crane, Jewett, Chesnutt, Twain, Wharton - a fair share of the best American writers, and a list that spans the century. But in England? By the 1890s, Kipling and Arthur Conan Doyle are writing short stories, soon to be followed by Maugham, Joyce, Lawrence - big names. Before that? The Cambridge Companion to English Literature, in entries for Trollope, Eliot, and Dickens, vaguely mentions the existence of short stories, often at the very end of a long entry. "The Christmas Carol" is a famous exception, maybe Dickens' other Christmas stories, as well. The puzzle is twofold. First, the number of American short story writers seems connected to the explosion of magazine publishing in the early 19th century. But England was experiencing the exact same phenomenon. The early essayists like Hazlitt and Lamb were all magazine writers. Dickens, too. Second, anthologists need short stories. You can't fit many novels into your Anthology of American Literature, but you can still represent every writer you want with a short story. Anthologies of English literature typically completely omit Dickens, Eliot, Thackeray, Hardy, the whole crew. Are the short stories of Dickens (Eliot, etc.) really not worth reading? I find that hard to believe. So I'm adding a note to my "To Read" list - I'll find out for myself. "Musical Eyes. I think sometimes that my lack of Musical ear, is made good to me through my eyes. That which others hear, I see. All the soothing plaintive brisk or romantic moods which corresponding melodies waken in them, I find in the carpet of the wood, in the margin of the pond, in the shade of the hemlock grove, or in the infinite variety & rapid dance of the treetops as I hurry along." I was wondering why I was making so little headway in Lost Illusions in the last few days. I know realize it’s because I was coming up on a big party scene. A Balzac party scene means indigestible speeches about whatever Balzac is worked up about, often with some sort of satirical intent, I guess. This one is about journalism. Journalists are cynical betrayers of all that is good in art and life, and publishers are even worse. OK. Now, on with the actual novel. Emerson’s essays can be hard traveling. He is not the friendliest companion. I’m not sure this should matter, but in the familiar essay, it does. Michel de Montaigne is the master of the form. His style is genial and conversational. Many of his successors imitate this manner in some way – Addison and Steele, Charles Lamb, William Hazlitt, Joseph Epstein. Plutarch, 1,000 years earlier, is similar. None of these writers are as profound as Montaigne can be, not remotely in some cases. But they all feel like they would make good friends. Or good dinner companions at least. Is this necessary for a great essayist? Francis Bacon’s essays are more like instructional pamphlets, little lectures. Thomas DeQuincey is a brilliant showoff, and I would think he would be a trial at dinner. Emerson wants to be Montaigne’s successor, and match him in moral seriousness (which I think he does). His concerns seem very private, though. He presents a certain view of the world that is original, but perhaps too much his own. Or maybe he is the sort of intense friend who always wants to discuss serious things and gets mad when you just want to make fun of Tom Cruise. Very rewarding to meet once every couple of weeks over lunch, but too strong a presence to see every day. I should try to dig into one of his essays more carefully. They’re worth the effore, but the effort is very real. And all of this is flummoxed a bit by the essay I just read, “Prudence”, which begins “What right have I to write on Prudence, whereof I have little, and that of the negative sort?” which is just the sort friendly stuff I’m talking about. John Galt is a Scottish novelist, active in the 1820s. His novel The Entail is superb, and The Provost is almost as good. I want to write more about Galt later, but here I just want to express my resentment at the misappropriation of his name on this idiotic anniversary. "The tall fellow came up with her cape and settled it on her shoulders as the admirers surged forward and the rest of us stood and stretched and began putting on our coats. All of us but one. Still waving his arm, Jaspers finally cried out, Miss Rand! Miss Rand! The room went quiet and she looked at Jaspers and he asked the question he’d been dying to ask. She jerked her head back as if she’d been slapped. All the dark-dressed men and women turned on him in utter loathing – a court of ravens about to eat the eyes out of the whey-faced, homesick boy with his chewed-up fingernails and puppyish need to be in on everything, who in his need had asked Ayn Rand the very question I had been itching to ask and probably would’ve if she hadn’t skunked me for mentioning Hemingway. Tobias Wolff, Old School, pp. 87-8. The Marquis Astolphe de Custine was an interesting fellow. His grandfather was one of the greatest Revolutionary generals, behind Lafayette, which did not save him from the guillotine. Custine's father also died on the guillotine. His mother barely escaped it, and was famous as a sort of Revolutionary martyr. Mme de Stael’s novel Delphine is named after her. Custine himself was a friend of Heine, Balzac, and the rest of literary Paris. Custine made a 3 month trip to Russia that was in some sense inspired by the publication of the first volume of Alexis de Tocqueville’s Democracy in America. A comparison between the two writers is inescapable, but what damage it does to Custine. Tocqueville was a brilliant thinker, gifted at generalizing. A real social scientist. If Democracy in America is not the most exciting book to read today, it is because many of Tocqueville’s insights have been so thoroughly absorbed by modern political science and sociology. Custine, by contrast, oh boy. Custine is an entirely conventional thinker, with no original ideas at all. Which does not stop him from constantly interrupting himself with the meaning of this and that aspect of Russia. The edition I am reading is abridged by about 15%. There’s another edition available that cuts the book down to 50%. I should have gone with that one. Because Russia in 1839 is a very interesting book when read as a conventional travel book, an account of anecdotes and adventures in a strange place. Democracy in America has virtually no conventional travel writing, but is a book of ideas. Custine, not having enough ideas, tells a lot of good stories. Custine is a sour traveler. He hates Russia and everything about it. This can be tiresome, but also fun. A few years earlier, Frances Trollope’s Domestic Manners of the Americans (short version: Americans have no manners) had been a huge hit in England. Custine’s book has a similar character. On one page he criticizes Russian flower arranging (“the flowers are not placed in such a manner as may render the interior of the apartment more agreeable, but so as to attract admiration from without”), then two pages later he attacks Russian furniture-moving (“the roads and bridges crowded with carriages, drowskas, and carts engaged in the removal of furniture, all the different kinds of which are heaped together with a slovenliness and disorder natural to the Slavonian race”). There is attention to detail in his dislike. Arriving at his inn, Custine, exhausted, throws himself on the sofa, where he rests for three minutes before the bugs become unbearable. The innkeeper tells him every sofa in Russia is like that, of course you don’t sleep on the sofa. From then on, Custine sleeps with a bowl of water under each leg of his bed. Russia in 1839 has been popular to readers interested in the Cold War as a way to see which aspects of Soviet culture were really just Russian. For example, Custine can’t enter the country until just the right official arrives, which doesn’t stop a dozen other officials from going through his baggage. Then he is assigned a completely inescapable “guide” for his entire trip. Sounds familiar. 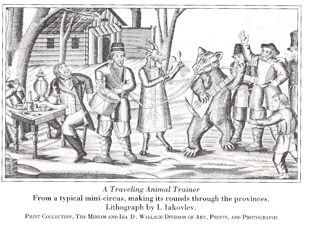 The edition I am reading includes a woodcut of a bear playing a sort of heavy metal guitar. I have not gotten to that part yet, I guess.